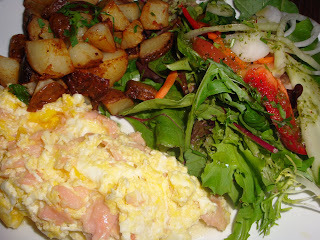 Feelings: Steven C wanted to try Polish brunch in Greenpoint, so I suggested Golden Cafe on the Nassau G stop. I noticed that this cafe was populated by local Polish residents, which is always a good sign. It was somehow rather empty at the height of brunch hour, however. Either way, I think we may have been the only non Polish customers, but the waitstaff was friendly and courteous, and I felt she really welcomed us with open arms. The place offers extremely reasonable brunch at $6 that includes three eggs with two fixings of you choice, hash brown and mixed greens. The portions are quite generous as well, and everything tasted exceptionally fresh. I especially enjoyed their well seasoned hash browns, and I could taste how fresh the potatoes were. 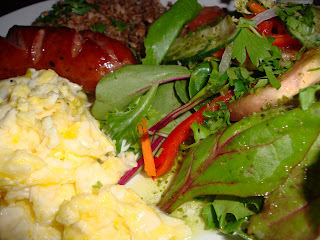 Steven C and RB both ordered $7 "Polish Brunch" dish that came with eggs, kielbasa, and buckwheat. "It IS Golden!" Steven C said. RB thought that eggs were little runny for his taste, but he enjoyed the balance of flavors on the plate. Golden Cafe has everything people want for brunch: affordability, portion, spaciousness, fresh vegetables, friendly staff, and local flair. If you want these qualities, furgetabout Manhattan. Furgetabout Williamsburg. Don't hesitate, go straight to Golden Cafe in Greenpoint.